Prompted by Charles Wyville Thomson—of the University of Edinburgh and Merchiston Castle School—the Royal Society of London obtained the use of Challenger from the Royal Navy and in 1872 modified the ship for scientific tasks, equipping her with separate laboratories for natural history and chemistry. The expedition, led by Captain George Nares, sailed from Portsmouth, England, on 21 December 1872. Other naval officers included Commander John Maclear. Under the scientific supervision of Thomson himself, she travelled nearly 70,000 nautical miles (130,000 km; 81,000 mi) surveying and exploring. The result was the Report Of The Scientific Results of the Exploring Voyage of H.M.S. Challenger during the years 1873–76 which, among many other discoveries, catalogued over 4,000 previously unknown species. John Murray, who supervised the publication, described the report as "the greatest advance in the knowledge of our planet since the celebrated discoveries of the fifteenth and sixteenth centuries". Challenger sailed close to Antarctica, but not within sight of it. To enable her to probe the depths, 15 of Challenger's 17 guns were removed and her spars reduced to make more space available. Laboratories, extra cabins and a special dredging platform were installed. Challenger used mainly sail power during the expedition; the steam engine was used only for powering the dredge. She was loaded with specimen jars, filled with alcohol for preservation of samples, microscopes and chemical apparatus, trawls and dredges, thermometers, barometers, water sampling bottles, sounding leads, devices to collect sediment from the sea bed and great lengths of rope with which to suspend the equipment into the ocean depths. Because of the novelty of the expedition, some of the equipment was invented or specially modified for the occasion. In all, she was supplied with 181 miles (291 km) of Italian hemp for sounding. On her 68,890-nautical-mile (79,280 mi; 127,580 km) journey circumnavigating the globe, 492 deep sea soundings, 133 bottom dredges, 151 open water trawls and 263 serial water temperature observations were taken. About 4,700 new species of marine life were discovered. The scientific work was conducted by Wyville Thomson, John Murray, John Young Buchanan, Henry Nottidge Moseley, Alphonse François Renard and Rudolf von Willemoes-Suhm. Frank Evers Bed was appointed prosector. The official expedition artist was John James Wild. As well as Nares and Maclear, others that were part of the naval crew included Pelham Aldrich, George Granville Campbell, and Andrew Francis Balfour (one of the sons of Scottish botanist John Hutton Balfour). Also among the officers was Thomas Henry Tizard, who had carried out important hydrographic observations on previous voyages. Though he was not among the civilian scientific staff, Tizard would later help write the official account of the expedition, and also become a Fellow of the Royal Society. The original ship's complement included 21 officers and around 216 crew members. By the end of the voyage, this had been reduced to 144 due to deaths, desertions, personnel being left ashore due to illness, and planned departures. 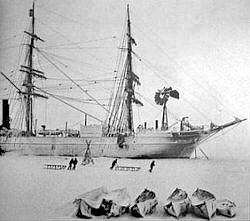 Challenger reached Hong Kong in December 1874, at which point Nares and Aldrich left the ship to take part in the British Arctic Expedition. The new captain was Frank Tourle Thomson. The second-in-command, and the most senior officer present throughout the entire expedition, was Commander John Maclear. Willemoes-Suhm died and was buried at sea on the voyage to Tahiti. Lords Campbell and Balfour left the ship in Valparaiso, Chile, after being promoted. Track of HMS Challenger from December 1872 till May 1876. The color contours represent ocean surface density. The first leg of the expedition took the ship from Portsmouth (December 1872) south to Lisbon (January 1873) and then on to Gibraltar. The next stops were Madeira and the Canary Islands (both February 1873). The period from February to July 1873 was spent crossing the Atlantic westwards from the Canary Islands to the Virgin Islands, then heading north to Bermuda, east to the Azores, back to Madeira, and then south to the Cape Verde Islands. During this period, there was a detour in April and May 1873, sailing from Bermuda north to Halifax and back, crossing the Gulf Stream twice with the reverse journey crossing further to the east. After leaving the Cape Verde Islands in August 1873, the expedition initially sailed south-east and then headed west to reach St Paul's Rocks. From here, the route went south across the equator to Fernando de Noronha during September 1873, and onwards that same month to Bahia (now called Salvador) in Brazil. The period from September to October 1873 was spent crossing the Atlantic from Bahia to the Cape of Good Hope, touching at Tristan da Cunha on the way. December 1873 to February 1874 was spent sailing on a roughly south-eastern track from the Cape of Good Hope to the parallel of 60 degrees south. The islands visited during this period were the Prince Edward Islands, the Crozet Islands, the Kerguelen Islands, and Heard Island. February 1874 was spent travelling south and then generally eastwards in the vicinity of the Antarctic Circle, with sightings of icebergs, pack ice and whales. The route then took the ship north-eastward and away from the ice regions in March 1874, with the expedition reaching Melbourne in Australia later that month. The journey eastward along the coast from Melbourne to Sydney took place in April 1874, passing by Wilsons Promontory and Cape Howe. When the voyage resumed in June 1874, the route went east from Sydney to Wellington in New Zealand, followed by a large loop north into the Pacific calling at Tonga and Fiji, and then back westward to Cape York in Australia by the end of August. The ship arrived in New Zealand in late June and left in early July. Before reaching Wellington (on New Zealand's North Island), brief stops were made at Port Hardy (on d'Urville Island) and Queen Charlotte Sound and Challenger passed through the Cook Strait to reach Wellington. The route from Wellington to Tonga went along the east coast of New Zealand's North Island, and then north and east into the open Pacific, passing by the Kermadec Islands en route to Tongatabu, the main island of the Tonga archipelago (then known as the Friendly Islands). The waters around the Fijian islands, a short distance to the north-west of Tonga, were surveyed during late July and early August 1874. The ship's course was then set westward, reaching Raine Island—on the outer edge of the Great Barrier Reef— at the end of August and thence arriving at Cape York, at the tip of Australia's Cape York Peninsula. Over the following three months, from September to November 1874, the expedition visited several islands and island groups while sailing from Cape York to China and Hong Kong (then a British colony). The first part of the route passed north and west over the Arafura Sea, with New Guinea to the north-east and the Australian mainland to the south-west. The first islands visited were the Aru Islands, followed by the nearby Kai Islands. The ship then crossed the Banda Sea touching at the Banda Islands, to reach Amboina (Ambon Island) in October 1874, and then continuing to Ternate Island. All these islands are now part of Indonesia. From Ternate, the route went north-westward towards the Philippines, passing east of Celebes (Sulawesi) into the Celebes Sea. The expedition called at Samboangan (Zamboanga) on Mindanao, and then Iloilo on the island of Panay, before navigating within the interior of the archipelago en route to the bay and harbour of Manila on the island of Luzon. The crossing north-westward from Manila to Hong Kong took place in November 1874. After several weeks in Hong Kong, the expedition departed in early January 1875 to retrace their route south-east towards New Guinea. The first stop on this outward leg of the journey was Manila. From there, they continued on to Samboangan, but took a different route through the interior of the Philippines, this time touching at the island of Zebu. From Samboangan the ship diverged from the inward route, this time passing south of Mindanao—in early-February 1875. Challenger then headed east into the open sea, before turning to the south-east and making landfall at Humboldt Bay (now Yos Sudarso Bay) on the north coast of New Guinea. By March 1875, the expedition had reached the Admiralty Islands north-east of New Guinea. The final stage of the voyage on this side of the Pacific was a long journey across the open ocean to the north, passing mostly west of the Carolina Islands and the Mariana Islands, reaching port in Yokohama, Japan, in April 1875. Challenger departed Japan in mid-June 1875, heading east across the Pacific to a point due north of the Sandwich Islands (Hawaii), and then turning south, making landfall at the end of July at Honolulu on the Hawaiian island of Oahu. A couple of weeks later, in mid-August, the ship departed south-eastward, anchoring at Hilo Bay off Hawaii's Big Island, before continuing to the south and reaching Tahiti in mid-September. The expedition left Tahiti in early October, swinging to the west and south of the Tubuai Islands and then heading to the south-east before turning east towards the South American coast. The route touched at the Juan Fernández Islands in mid-November 1875, with Challenger reaching the port of Valparaiso in Chile a few days later. The next stage of the journey commenced the following month, with the route taking the ship south-westward back out into the Pacific, past the Juan Fernández Islands, before turning to the south-east and back towards South America, reaching Port Otway in the Gulf of Penas on 31 December 1875. Most of January 1876 was spent navigating around the southern tip of South America, surveying and touching at many of the bays and islands of the Patagonian archipelago, the Strait of Magellan, and Tierra del Fuego. Locations visited here include Hale Cove, Gray Harbour, Port Grappler, Tom Bay, all in the vicinity of Wellington Island; Puerta Bueno, near Hanover Island; Isthmus Bay, near the Queen Adelaide Archipelago; and Port Churruca, near Santa Ines Island. The final stops, before heading out into the Atlantic, were Port Famine, Sandy Point, and Elizabeth Island. Challenger reached the Falkland Islands towards the end of January, calling at Port Stanley and then continuing northward, reaching Montevideo in Uruguay in mid-February 1876. The ship left Montevideo at the end of February, heading first due east and then due north, arriving at Ascension Island at the end of March 1876. The period from early- to mid-April was spent sailing from Ascension Island to the Cape Verde Islands. From here, the route taken in late April and early May 1876 was a westward loop to the north out into the mid-Atlantic, eventually turning due east towards Europe to touch land at Vigo in Spain towards the end of May. The final stage of the voyage took the ship and its crew north-eastward from Vigo, skirting the Bay of Biscay to make landfall in England. Challenger returned to Spithead, Hampshire, on 24 May 1876, having spent 713 days out of the intervening 1,250 at sea. 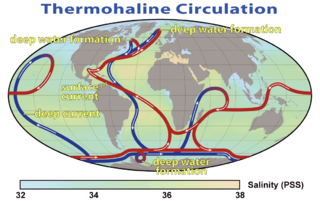 To investigate the physical conditions of the deep sea in the great ocean basins—as far as the neighborhood of the Great Southern Ice Barrier—in regard to depth, temperature, circulation, specific gravity and penetration of light. To determine the chemical composition of seawater at various depths from the surface to the bottom, the organic matter in solution and the particles in suspension. To ascertain the physical and chemical character of deep-sea deposits and the sources of these deposits. To investigate the distribution of organic life at different depths and on the deep seafloor. 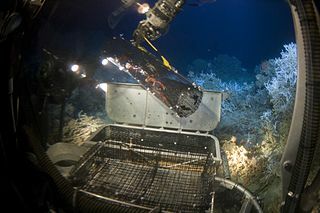 At each of the 360 stations the crew measured the bottom depth, temperature at different depths, observed weather and surface ocean conditions, and collected seafloor, water, and biota samples. Challenger's crew used methods that were developed in prior small-scale expeditions to make observations. To measure depth, they would lower a line with a weight attached to it until it reached the sea floor. The line was marked in 25-fathom (150 ft; 46 m) intervals with flags denoting depth. Because of this, the depth measurements from Challenger were, at best, accurate to the nearest 25-fathom (150 ft; 46 m) demarcation. The sinker often had a small container attached to it that would allow for the collection of bottom sediment samples. The crew used a variety of dredges and trawls to collect biological samples. The dredges consisted of metal nets attached to a wooden plank and dragged across the sea floor. Mop heads attached to the wooden plank would sweep across the sea floor and release organisms from the ocean bottom to be caught in the nets. Trawls were large metal nets towed behind the ship to collect organisms at different depths of water. Upon the retrieval of a dredge or trawl, Challenger crew would sort, rinse, and store the specimens for examination upon return. The specimens were often preserved in either brine or alcohol. The primary thermometer used throughout the Challenger expedition was the Miller–Casella thermometer, which contained two markers within a curved mercury tube to record the maximum and minimum temperature through which the instrument traveled. Several of these thermometers would be lowered at various depths for recording. However, this design assumed that the water closer to the surface of the ocean was always warmer than that below. During the voyage, Challenger's crew tested the reversing thermometer, which could measure temperature at specified depths. Afterwards, this type of thermometer was used extensively until the second half of the 20th century. On 23 March 1875, at sample station number 225 located in the southwest Pacific Ocean between Guam and Palau, the crew recorded a sounding of 4,475 fathoms (26,850 ft; 8,184 m) deep, which was confirmed by an additional sounding. As shown by later expeditions using modern equipment, this area represents the southern end of the Mariana trench and is one of the deepest known places on the ocean floor. Modern soundings to 6,012 fathoms (36,070 ft; 10,994 m) have since been found near the site of the Challenger's original sounding. Challenger's discovery of this depth was a key finding of the expedition in broadening oceanographic knowledge about the ocean's depth and extent and now bears the vessel's name, the Challenger Deep. Findings from the Challenger expedition continued to be published until 1895, nineteen years after the completion of its journey. The report contained 50 volumes and was over 29,500 pages in length. Specimens brought back by Challenger were distributed to the world's foremost experts for examination, which greatly increased the expenses and time required to finalize the report. The report and specimens are currently held at the British Natural History Museum and the report has been made available online. Some specimens, many of which were the first discovered of their kind, are still examined by scientists today. A large number of scientists worked on categorising the material brought back from the expedition including the palaeontologist Gabriel Warton Lee. George Albert Boulenger, herpetologist at the Natural History Museum, named a species of lizard, Saproscincus challengeri, after Challenger. As the first true oceanographic cruise, the Challenger expedition laid the groundwork for an entire academic and research discipline. "Challenger" was applied to such varied phenomena as the Challenger Society for Marine Science, the oceanographic and marine geological survey ship Glomar Challenger, and the Space Shuttle Challenger. ^ a b c Rice, A.L. (1999). "The Challenger Expedition". Understanding the Oceans: Marine Science in the Wake of HMS Challenger. Routledge. pp. 27–48. ISBN 9781857287059. ^ a b c d e The Voyage of H.M.S. Challenger 1873–1876. Narrative Vol. I. First Part. Chapter I – pages 19 and 20 list the civilian staff and naval officers and crew, along with changes that took place during the voyage. ^ Scott, Keith (1993). The Australian Geographic book of Antarctica. Terrey Hills, New South Wales: Australian Geographic. p. 115. ISBN 978-1862760103. ^ a b c d e Bishop, Tina. "Then and Now: The HMS Challenger Expedition and the "Mountains in the Sea" Expedition". oceanexplorer.noaa.gov. NOAA. Retrieved 31 January 2018. ^ a b c d e f g h The account of the expedition route given here is based on the 40 official nautical charts produced by the expedition, available at: Challenger Expedition (1872–1876) (University of Kansas Natural History Museum), accessed 02/02/2012. This also includes a map of the expedition route. ^ a b "HMS Challenger: Science". Birch Aquarium. Archived from the original on 26 January 2013. Retrieved 3 December 2013. ^ "HMS Challenger – The science: dredging and trawling". Aquarium. University of California, San Diego. Archived from the original on 19 February 2015. Retrieved 13 October 2014. ^ "Report on the scientific results of the voyage of H.M.S. Challenger during the years of 1872–76 (page 877)". 19thcenturyscience.org. Retrieved 26 March 2012. ^ Amos, Jonathan (7 December 2011). "Oceans' deepest depth re-measured". BBC News. Retrieved 7 December 2011. ^ "IHO-IOC GEBCO Gazetteer of Undersea Feature Names". GEBCO. August 2011. Retrieved 20 March 2012. ^ "HMS Challenger: Findings". Natural History Museum, London. Retrieved 3 December 2013. ^ Beolens, Bo; Watkins, Michael; Grayson, Michael (2011). The Eponym Dictionary of Reptiles. Baltimore: Johns Hopkins University Press. ISBN 9781421401355. ("Challenger", p. 51). ^ "Challenger (STA-099, OV-99): Background". John F. Kennedy Space Center. Archived from the original on 3 February 2009. Retrieved 21 December 2008. Wikimedia Commons has media related to Challenger expedition. Log-letters from "The Challenger" (1876), Lord George Granville Campbell, Macmillan. Notes by a Naturalist on the "Challenger" (1879), Henry Nottidge Moseley, Macmillan. Sir Charles Wyville Thomson was a Scottish natural historian and marine zoologist. He served as the chief scientist on the Challenger expedition; his work there revolutionised oceanography and led to his knighthood. Pourquoi Pas? IV was the fourth ship built for Jean-Baptiste Charcot. She completed the second Charcot expedition of the Antarctic regions from 1908 to 1910. Charcot died aboard when she was wrecked on 16 September 1936, off the coast of Iceland. Of the forty men on board, only one survived. Melanocetus murrayi, commonly known as Murray's abyssal anglerfish, is a deep sea anglerfish in the family Melanocetidae, found in tropical to temperate parts of the world's oceans at depths down to over 2,000 m (6,600 ft). Its length is up to 13.5 cm (5 in) for females and up to 2.8 cm (1.1 in) for males. The Valdivia Expedition, or Deutschen Tiefsee-Expedition, was a scientific expedition organised and funded by the German Empire under Kaiser Wilhelm II and was named after the ship which was bought and outfitted for the expedition, the SS Valdivia. It was led by the marine biologist Carl Chun and the expedition ran from 1898-1899 with the purpose of exploring the depths of the oceans below 500 fathoms, which had not been explored by the earlier Challenger Expedition.